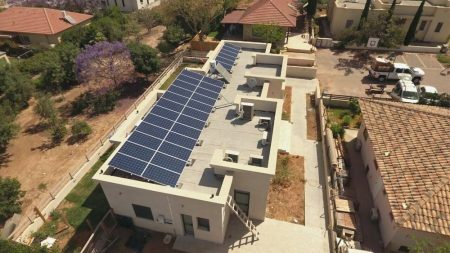 This commercial solar energy system was built on top of the Sderot public library. 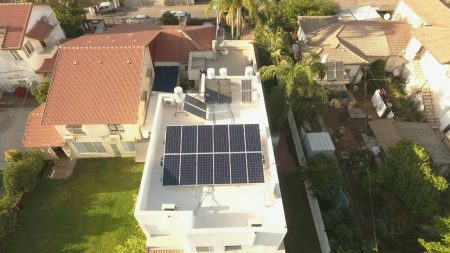 This system was built as part of the tender issued by the municipality of Sderot to build the town’s solar systems on top of several public buildings and schools. This system is unique since it was built on top of the building’s protective system. The system’s construction necessitates an exact design, individually adapted to this protection which is made of steel. The panels were installed on top an aluminum construction to prevent injury to the protection measures. The construction is a floating construction on top of an element welded to the roof and separating the aluminum construction from the building’s protection. This solar energy system which was assembled in August 2011 has Kaco inverters and Suntech panels for generating this green electricity. At the town’s scientific schools you can watch the data of the solar electricity produced in real time on the screens installed inside the school’s premises. This way the students learn another lesson in environmental protection and on how the school contributes to minimizing greenhouse gas emissions and use of natural resources.